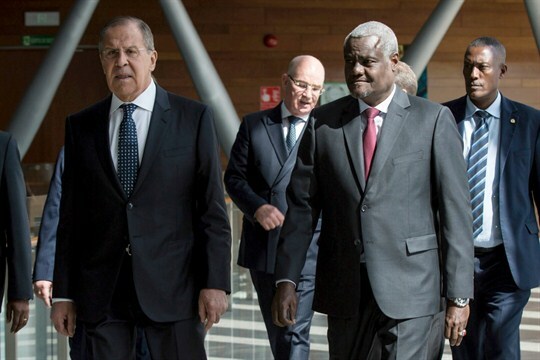 Russian Minister of Foreign Affairs Sergey Lavrov and Moussa Faki Mahamat, chairman of the African Union Commission, arrive at the commission’s offices in Addis Ababa, Ethiopia, March 9, 2018 (AP photo by Mulugeta Ayene). In early March, Russian Foreign Minister Sergey Lavrov embarked on a five-country tour of sub-Saharan Africa. During his trip, Lavrov signed new trade agreements with Russia’s two long-standing partners in southern Africa, Angola and Mozambique. He also strengthened Moscow’s diplomatic ties to Zimbabwe’s new government and highlighted the role Russia could play providing security to several countries facing political unrest at home.